Please select RV Bed Size from the drop down menu above. What is a mattress topper? A mattress topper is a layer designed to lie atop an existing mattress. Their function is to provide a layer of comfort. We have a down alternative mattress topper that will knock your socks off with benefits! Our down alternative is made from specialty poly silk fiber that mimics down and silk in softness and insulating qualities. 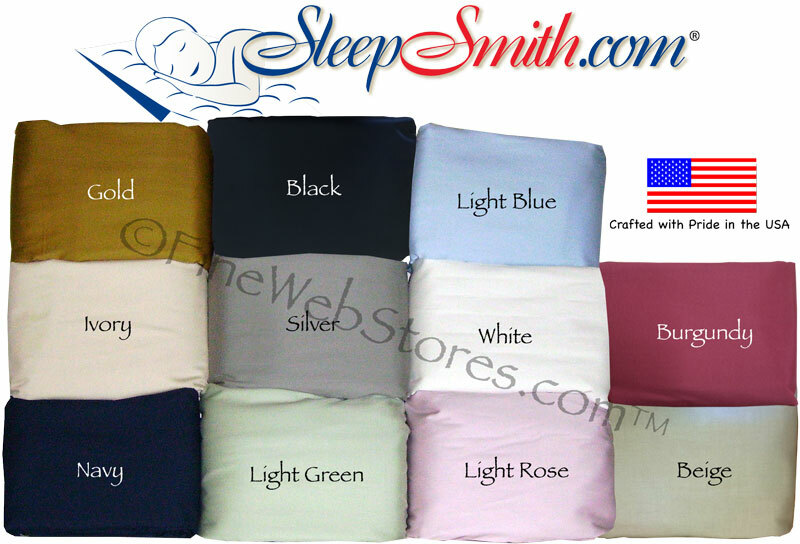 We take this fiber and sew it into a top quality white 230 thread count 100% cotton cover. The box baffles are spaced between 12 inches and 15 inches square, depending upon the size of the down mattress topper that we are sewing. These baffles help hold the down alternative in place. 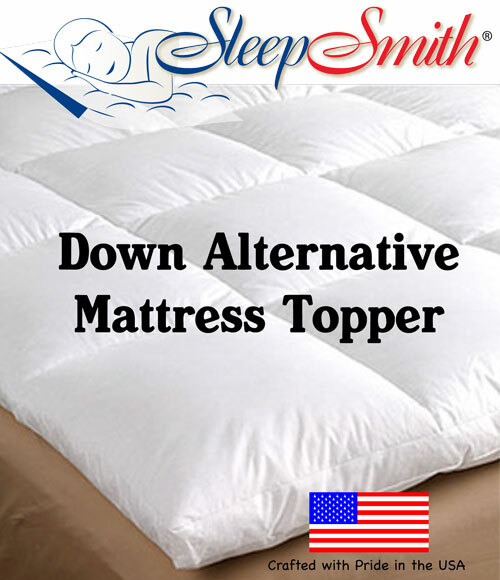 Our Down Alternative Mattress Topper is approximately 5 inches thick when fluffed up. Some of this thickness is due to air. The topper filling is designed to be light and fluffy, not solid like a foam topper. Down Alternative has a much lower price than down and feathers. Down Alternative is softer than down or feathers. Down Alternative is WAY MORE Hypoallergenic than down or feathers. Down Alternative has a much longer life span than down or feathers. Down Alternative keeps loft much better than down or feathers. We custom sew this for you. 95% of our orders ship within 10 days plus transit time. Feather beds and Down Alternative Mattress Toppers are designed to just lay on top of a mattress. There are no straps or attachments. Gravity does the work. When I asked a fine older sales lady who has been sewing feather beds all of her life, "how does the feather bed stay where it is supposed to stay?" she said, "it just does." Words of wisdom. Upon receipt of your RV Bed Down Alternative Mattress Topper, it will be squashed a bit to save you shipping charges, so it will need to be fluffed up. 95% of our orders ship within 10-15 business days plus a few days for transit time. You may want to add an optional set of our luxury 100% cotton 300 thread count deep pocket sheets. You will need a deeper pocket sheet set to accommodate the extra height that our Down Alternative Mattress Topper will add to your bed. Our sheets will work for a mattress of a depth of 12 to 20 inches. We have some great colors to choose from. Set includes a top sheet, deep pocket bottom sheet and pillowcases. We also offer an optional matching comforter to the sheets. It is made from the same material as the sheets. The optional waterproof deep pocket mattress pad can fit over the your Down Alternative Mattress Topper and your mattress for your topper protection. The mattress pad is also good for a 12 to 20 inch mattress height and has stretchy material along the entire perimeter of this mattress pad including the pockets for a sure fit. This pad lays directly on the top of the mattress and topper for protection. This mattress pad is washable in cool water with mild detergent, no bleach. Cool dry and do not iron. Our waterproof mattress pad is designed to be super comfortable. It is composed of two layers, the top layer is a soft white terry cloth material and the bottom layer is a space age quiet pliable thin vinyl material. 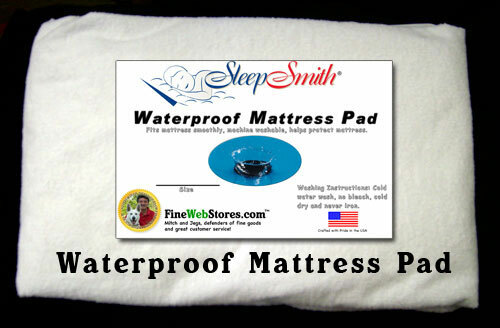 The combination of both, absorbs a spill but does not allow the spill to seep through to your mattress. The terry cloth fabric is antimicrobial for your protection. The vinyl membrane backing provides stain protection from spills, leaks and bodily fluids. RETURN AND CANCELLATION POLICY:Please note that we CUSTOM sew this for you, so please measure and order carefully. This is a personal care item so we cannot re-sell a return. Cancellation of an order is generally impossible as we start sewing ASAP. We can only accept returns within 30 days of order, a 50% re-stock fee will apply. Our 100% cotton cover has stitched baffles that run horizontally from the head of the bed to the foot of the bed and are approximately 6 inches wide.